We designed NetStaX dynamic-link library (DLL), middleware and driver software solutions to enable network connectivity for organizations that develop products for manufacturing, industrial automation, water and wastewater, transportation, and oil and gas. Use NetStaX solutions to verify your products are functional, conformant and interoperable. 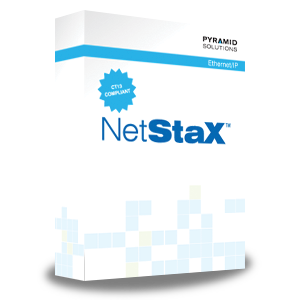 Pyramid Solutions’ NetStaX EtherNet/IP Scanner DLL Kit (EIPS) allows you to quickly introduce EtherNet/IP Scanner Class (Client/Originator) functionality into your PC/Windows-based applications and products. NetStaX EtherNet/IP Adapter DLL Kit (EIPA) enables you to quickly introduce EtherNet/IP Adapter Class functionality into your PC-based products and systems. NetStaX EtherNet/IP Middleware and Driver Package (EIPLD-M) enables you to quickly interface your Zebra XR440, 450, 480 or FX7400 series fixed-RFID reader to Rockwell Automation ControlLogix/CompactLogix Controllers or any other EtherNet/IP Scanner Class (client) device.